Whether your apartment walls are covered in pop art or not, this Shoulder Bag from Incase’s Andy Warhol collection brings an entirely new sense of style to the laptop bag. Granted, it’s not as durable as some of the other bags we’ve seen this week, nor does it protect your gadgetry as well, but it does have one thing that the other bags don’t: a banana. All jokes aside, this bag actually got the job done rather well and with more than a few pairs of eyes on me. Whether onlookers were making fun of me for carrying an Andy Warhol bag (not likely in this part of Brooklyn) or they were digging my style is yet to be determined. Either way, the bag suited my needs just fine, though it is a tad heavier than some of the other bags I’ve toyed with this week. 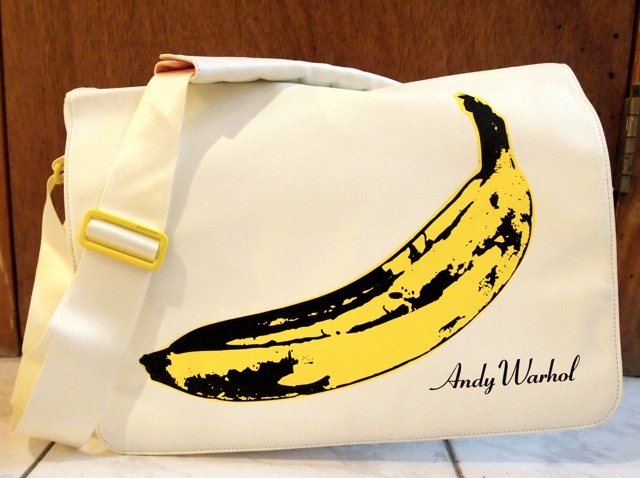 Let’s face it, the Andy Warhol Banana bag is much more about style than it is utility. The quilted interior feels way more high-end than Incase’s standard faux fur lining, but I’m not convinced it offers the same level of protection. When I put my bag down on the floor, I could really feel the laptop hitting the ground, whereas in a bag like the Incase Sling Sleeve that wasn’t the case. The bag is a tad heavier than I’d have liked, but still comfortable nonetheless. Still, I found myself missing that breathable mesh that Incase seems to be so fond of, and feeling bothered by the rigid, leather-like shoulder pad on this bag. It’s removable, which is the good news, but the bad news is that the seat belt-style nylon strap underneath cuts pretty bad if you’re packing a MacBook Pro or anything semi-heavy. Plus, it’s fitted with custom metal hardware that can hurt if the strap gets twisted (as bag straps often do). But unlike the Incase Alloy Series Compact Backpack, this bag’s dedicated iPhone/iPod pocket is 100 percent accessible. I really couldn’t be more pleased with it, either. The zipper slides back and forth just fine, but the brilliant part is that the pocket itself is tilted with the opening higher than the pocket, so you can theoretically leave it unzipped and not risk your precious falling to its demise. The best thing about the bag is the space. I was able to tote around my MBP, a tablet, a notebook, my camera, and plenty of other little day-to-day junk. But again, the bag is a bit heavy which discouraged filling the bag to its potential, as did the rigid shoulder strap. Tough one, but I’m gonna go with Andy Warhol fans, the potassium-deficient, and anyone who looks good in cream-colored accessories. But seriously, this bag can actually hold quite a bit of your stuff, so anyone who’s looking for something where utility and style compromise should give this some thought. Eh. It’s a fine bag and all but I don’t care enough about Andy Warhol or bananas to sacrifice comfort. Shoulder bags are already a bit more uncomfortable than your standard backpack because the weight isn’t being evenly distributed at all, so that shoulder strap really needs to be a pleasure and the bag, in my opinion, should be relatively small so as to not get too heavy when full. Not everyone may agree with that, but it’s just my two cents. I do, on the other hand, give storage space, accessibility, and style five stars each so just because it’s not the bag for me doesn’t mean it’s wrong for you. If you are used to carrying around a heavy shoulder bag and don’t mind a somewhat uncomfortable strap because of it, well then by all means start saving. It does, after all, cost a pretty penny. Check out the rest of Bag Week 2011 here.